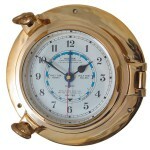 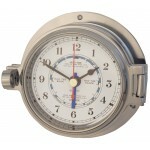 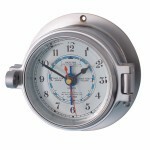 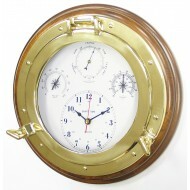 The wood mounted porthole tide clock is made of solid, unlacquered brass with an opening bezel and bevelled glass. 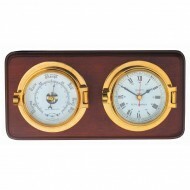 Tide clocks feature an additional hand which records lunar time over a 24 hours 50 minute period and so indicates successive high and low tides. 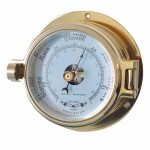 A wood mounted weatherman (18080) 4 in .. 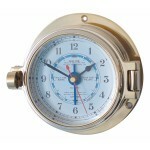 The Channel Range of instruments is made of solid unlaquered brass with an opening latch and bevelled glass. 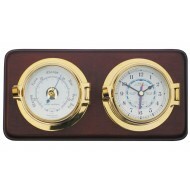 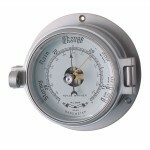 The tide clock has a quartz movement and features an additional hand which records lunar time over a 24 hours 50 minute period and so indicates successive high and low tides.The barometer is ..